Whenever I'm asked about what I love about working in the Art Studio at The Eric Carle Museum of Picture Book Art, I think about an interaction I had with a couple of young guests, J and B (brothers), and a tissue paper collage project. This encounter is a great example of how working with materials can help develop and hone creative problem-solving skills. The materials on this particular day included colored tissue papers, oil pastels, liquid starch, glue brushes, and scissors. Each guest to the Art Studio also received two different size pieces of watercolor paper. Maybe you remember my post On Limitations explaining why we offer only certain materials or limit quantities for a given project? I think it was B who first requested some tape. My response was to ask him, "What is it you're trying to do?" Whenever someone in the studio asks for a material that's not being offered this question is usually how we reply. We've found that it's a great way to find out whether they need my help in solving a problem or if they need a material for another purpose, like a temporary eyeglasses fix. It also is a great opportunity for young learners to practice using language to describe something visual and/or action-based. 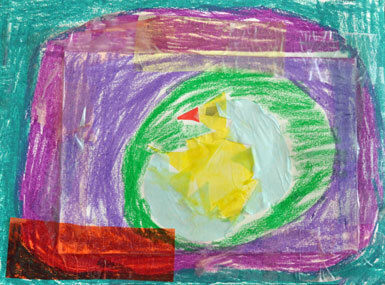 As we looked at his work, B explained that he wanted to put his tissue paper collage of a baby bird breaking through its shell on top of a larger piece of paper that he filled-in with oil pastel. I could easily have provided tape, but instead asked B, "Do you think there is anything here on the table you can use to connect your pictures?" Sometimes, just getting a child to re-notice what's in front of them sparks the idea they need to continue. Sometimes a child needs more questioning to help them see potential solutions. I asked B to tell me why tape works to connect things (it's sticky) and if any of the materials available were sticky. Together, we talked about how the liquid starch glue is sticky, but also runny, so we tested it as an adhesive for two scraps of watercolor paper. B discovered that liquid starch is not strong enough to hold two thick papers together on its own. At this point, I reminded him to think about how tape is basically just sticky paper. Now, I can't remember if he figured it out on his own, or if I wondered aloud, "could we use the tissue paper and starch to make our own tape?," but it was something B was willing to try. He was excited to have created an aesthetically pleasing solution for his picture. I could have just given him the solution, right from the start, but that's not what we're going for in the studio. Our goal is to help foster our guests' cognitive and intellectual development, not just get them to an aesthetically pleasing end result. Later, when his brother J wanted to try the solution too, I asked B to explain to his brother how to use tissue paper like tape. Whenever possible, I try to get children to help each other problem solve. There's another level of learning added to an art-making experience when the creator verbally shares their process or idea. Peers can be great teachers, at any age! Sometimes, children come up with artistic solutions and test them only to discover they don't work. Those are valuable moments for learning too! In those times its important that I make non-judgmental observations about their work and, if appropriate, their emotions. (i.e." I see that your paper isn't sticking in place. Is that making you frustrated?") and encourage them to risk trying another solution. In those moments I learn too. Reciprocal learning is what making art with children is all about! Update: 6/27/2018: We no longer use store-bought liquid laundry starch in the Art Studio and instead use AP certified non-toxic Elmer's Art Paste. This entry was posted on Saturday, August 11th, 2012 at 3:49 pm and is filed under By Meghan Burch, Collage, Elementary School, Every Day Art Program, Our Approach, Preschool. You can follow any responses to this entry through the RSS 2.0 feed. You can leave a response, or trackback from your own site. This really makes me think about how we can promote children's creativity - we don't need to stand back and watch children helplessly. Instead, we can encourage children to look again, think outside of the box, and reconsider. Thank you so much for sharing!